Love the look of this one, I take it that it can be built piece by piece for those of us trying to avoid a mortgage. I’m in Texas, though- could I flip the plan to make it more suitable for a climate that’s stupid hot 8 months out of the year? I wouldn’t build domes in Texas or any other hot, humid climate. You can only add so many windows before you weaken the structure. And earth lodges don’t get much ventilation. It will always be muggy inside. Choose something with lots of windows like Summer Breeze or one of my roundhouses. I like this plan very much. I’d like to obtain a blue print and be able to build this as my retirement home. Is there any plans available for this house? I’ll also need all the advice I can get on the construction and interior design; is there a book, or dvd that will help? If so, where do I get them…quick?! I love it! Your Cottage looks sensible. The major obstacle is the location of my lot is in a gated area (Green Springs Ranch) in El Dorado County, California and the onerous C.C.&R’s as well as the El Dorado Govt Building regulations and fees. I’ve owned the “8 2/3” acres for about 20 years and have attempted several times to build, but had to abandon the effort. The taxes and fees alone are more than the cost of building. You’re right. Meeting codes can drastically increase construction costs. That’s why we often recommend building in rural areas with few or no codes. Now, that’s not always practical, but it’s something to be aware of. Of all of your designs I’ve seen, this is probably my favorite. As a DIY builder, what’s the round about figure to build this model? For the materials that is. I already have an accessible quarry for bag filler and foundation. Thanks. There’s no way to give an estimate because costs vary so much from area to area. You have to make a cost estimate based on your local costs. The bags are a big part of the cost and they keep going up. So search for used bags in good condition from farmers, breweries, feed stores, etc. I can build for $6-$12/sq. ft., but the cost would likely be higher for most. I can buy new bags 18.5 by 35 inches for 35 cents each. 3000 bags cost a total of 1110.00 US Dollars, including taxes. I picked them up since they are about an hour from us. Four large dump truck loads of good clay/sand soil cost me 320.00 US Dollars. Do some research and make a few calls to businesses, your local county co-op, and county agent and you’ll get some good leads of whom to call for your materials. Hi Owen, I love this design, and with 2 kids whom each want their own room it is perfect. the only thing has me wondering though, why would you put one bedroom on the oposite side of the house the bathroom ? If I was to purchase the designs, would there be much much hassle getting it so the two smaller bedrooms where able to access the bathroom without going through the rest of the house ? We can talk about that option. Off the top of my head I don’t see how that would work. You need space to walk between rooms. For instance, the bath is now centered through the middle of the laundry room. Where would you put the doors? Am a project Director with Fanya Mambo Foundation, a small grassroots non-profit based in Kenya that works with unemployed youths and disadvantaged community members, helping create educational and economic opportunities. We will be doing an earthbag guest house that is to house our volunteers, I have been researching for a good design and i like this design. The big question therefore is; Can we purchase the design at a subsidized rate? if yes, how much will it be, so we can start fundraising for it? or better still, we would really appreciate if you were to donate them to our good cause. Project Director, Fanya Mambo Foundation. These are better than fantastic. Have never even heard of anything like this as far as living area. Closest I have experienced is the old root cellars that were attached to farm home. Do you do the building also? This would be perfect for my business and I could grow the sweetgrass on the roof also. Thanks. This design is an example of how my small, simple plans can be combined. It can be built all at once or in stages. You can also add other options if you want — rootcellar, cool pantry, survival shelter, greenhouse, etc. I love this home could the Loundry area and bathroom be switched so that guests could access the bathroom easier. ie is there room to do this? Yes, I’ll make that change for free. You’re the second one to mention this and now I think this change is for the best. Thank you Owen, It’s going to be a while before we are ready for our build. But as of now this is the plan we are leaning toward. How is the plumbing for a water system and waste removal designed? That’s all standard — same as any other house. Tips include running the plumbing up through an interior 2×6 plumbing wall, using 1/4″ rebar to mount fixtures to earthbag walls, running pipes on the surface of walls or inside cabinets. Would I be able to build earth bag homes in the ozarks in mossuri? I know it is humid but is it too humid? Sure, no problem. Research house design tips for humid climates (common throughout the south) — tall ceilings, lots of cross ventilation, wrap-around porches, ceiling fans, etc. and use the best ideas in your house. I love this design. Ever since I have heard of Earthbag homes I have been obsessively doing as much research as possible. I want to do polished concrete floors with radiant heat. Would that be possible with the loft floors also or would it be too heavy? And would it be possible to add a greenhouse to the south side of the lodge? I love this plan, but I think I would make each bedroom into a master so the kids have their own bathroom. how much one cost and how do you get one? They don’t list every plan, so you’ll have to order a Custom Plan (during check-out) and leave a note asking for the plan you want. 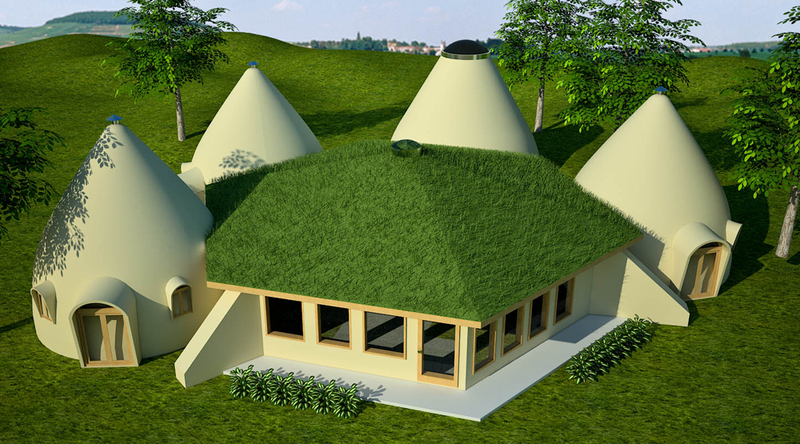 I really like the Enviro Earthbag Dome 2 as well as the Earthbag Lodge with Domes. What would be changed to accommodate our hot and rainy Kauai, Hawaii climate? What kind of foundation would need to be used? I know on one posting you said these types of buildings should not be used in our climate but I know its been done on the Big Island and on Maui and have been permitted, it just took a while to build because of the rain. Somebody I spoke to said you’d have to put a roof on in a wet climate. What type? Also, how can one capture rainwater from these? Lots of people do lots of things. We guide people using best practices. A lot of domes end up leaking eventually in rainy climates and so roofs are highly recommended. Go to our Projects and Pictures page to see various types of roofed domes people have built. http://earthbagbuilding.com/projects/projects.htm Add gutters to the edge of the roof so you can collect roofwater. A standard earthbag foundation is fine: rubble trench foundation with French drain, gravel bags on lower courses (double bagged for strength). You can also use stabilized soil on lower courses. Kelly and I both love scoria (lava rock). That’s the best material if you can get it. 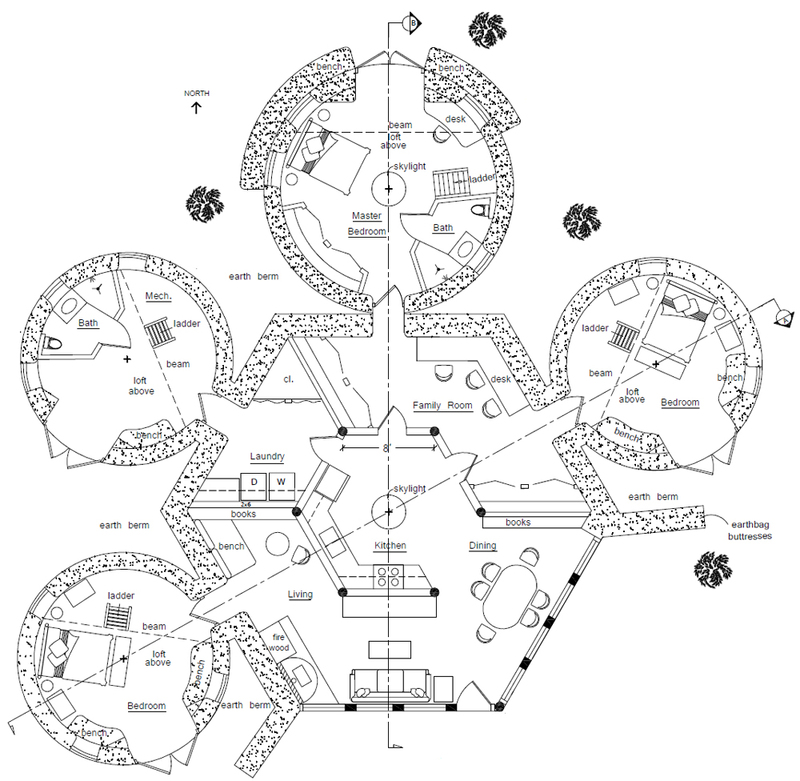 Kelly has a detailed dome guide at the link above that explains how to build with scoria. I would love to have these plans asap as I will be starting the process in May. I did email the strawhouses address, but haven’t gotten a reply. I see in a lot of your designs that there are living roofs. What is the benefit of a living roof? They help insulate the roof, look good, provide habitat, oxygenate the air, provide space for growing herbs, strawberries, etc. Google living roofs. They work best in rainy climates. I am in the pre-planning/brainstorming stage for a new construction and I really like this design quite a bit. One desirable quality of a home for us is a raised deck of some sort. Since we are located in central New Mexico the amount of rainfall wouldn’t be enough to support a living roof. Do you see any major issues with re-purposing the roof area as a deck? My thoughts were to have a set of steps from between the utility dome and the master bedroom leading up to the deck. I have also considered the possibility of building the Master bedroom dome up a bit higher to allow a door to the deck from the loft in the Master Bedroom. 1) In your initial design, it seems like there would be a peaked roof with dirt/plants on top of it, correct? I assume it would have to be quite strong to support the weight of earth above it, but what about using a flat roof design? Is there a certain roofing method you would recommend to ensure enough strength for use as a deck, or is this not as much of a concern as I am thinking? 2) The living roof design provides additional insulation, with a flat, non-living roof design, what would you recommend as far as insulation needs for the roof? Thank you for providing so many phenomenal designs and resources for those interested in this building style. I certainly hope I can put together a feasible design, if this ends up seeming like a doable project I’d love to order the plans and adjust them to fit my purpose. I see in this project in Mexico, you incorporated a somewhat similar roof/deck concept. Would you recommend something along these lines for proper strength/drainage? My other concern for a poured concrete slab roof on a larger area such as the hexagonal lodge region is the weight. In your drawing, are those support posts in each corner of the kitchen? Would these be able to support the necessary weight? I agree about NM being too dry to support a living roof. It wouldn’t work there. What you’re suggesting is a major overhaul of the design and so it’s hard to know exactly what you’re planning and give proper advice. I suggest hiring a local designer who does this type of work and who knows all the codes in your area. You can use my plans as a starting point and they can make all the necessary changes. Paying extra for my CAD plans will likely save you money in the long run because much of the work will already be done. What tips would you give to someone who wants to build in Arizona near Kingman? It isn’t humid but it can be pretty hot. We have been looking at this plan for a while and absolutely adore it. This would be a good plan for that area. Be sure to sort out the code requirements before ordering. Code enforced areas are much more difficult and costly to deal with. Approximately how much will the materials cost come out to be for this design? Hi, Can you point me to someone in the Central American country of Belize, who can do some needed training in building Earth bag structures please. This technique can greatly increase the chances of our people here to own their own homes! Can this design be bermed at all? What kind of design would you suggest for someone living in Seattle Washington? I love this look, but would it be ok for this area? I love this!! Any chance you’d come build one for me in Australia… 🙂 I do not have a builders bone in my body but am now determined to research how to build myself one of these. Just beautiful!!!! Natural building is human scale. It’s way different than building with steel and concrete that require professional training. Do the homework then start with a tiny project like a demonstration corner or tool shed and you’ll soon realize what to do. You just have to ‘awaken’ the dormant natural skills that have been lost in our modern world. My husband and I are looking into building an Earth Bag home on our property but we have some concerns. We live in San Antonio, TX so we aren’t sure what kind of layout would work best for this climate. We do have two children that would require their own rooms. A three bedroom would work best for us. Could you please give us your input, we would greatly appreciate it. We really love this design! Would it be possible to build the bedrooms as a roundhouse instead of a dome using these plans? Or would we need to build the lodge and then use one of your roundhouse plans for those additions? Is there any concern with earth berms on a roundhouse vs a dome? Hi, are you still replying in this thread? I am very interested and is there a PDF for this? Yes, I check every day. You can order through Dream Green Homes. If you don’t have any codes, then yes, you can replace the domes with roundhouses. They’re way easier to build than domes. They’re also less prone to roof leaks. Berms are great. Because of the thick walls all you really need is about 2′ high berms. You want an open plan with windows on all sides. Cathedral ceilings and ceiling fans are also very helpful. Good ventilation means you probably won’t need a cooling system (unless you’re real particular). Be sure to read my two free articles on the Natural Building Blog called Passive Cooling Strategies. Choose about 10 techniques such as wide roof overhangs, etc. Keep the sun off the walls with trellises, etc. Another good option is to build one small structure at a time and join with breezeways. Every design can. Because of the thick walls all you really need is about 2′ high berms. Domes are for deserts. You want pitched roofs. If you really like the layout then build roundhouses instead of domes. They’re much easier to build than domes. Hello I’m looking at building an earth bag house on Macleay Island, Queensland, Australia. Have you had any Australians build your designs here? I really like this one but want a 4 bedroom home, is this something you can add to the plan? And the cost os $300 USD per plan? My block size is 650sqm. Also have you designed commercial properties with earth bags? And if so where do I find these? I am looking at building a small local shopping centre that can incorporate a hostel, cafe, bar and 8 small shops on a 630 sqm block of land on Russell Island, Queensland, Australia. Are all these complaint with Australian building codes? If not does it take much for it to be compliant? I really love your designs and this will be the first time I will be building a house and I want to be able to do as much of the work as I can with my son. Earthbag is not in the official code, although we know an engineer who can get it code approved. However, the extra cost of doing this will likely make the project overly expensive. Forget about saving money. Might as well build conventionally because codes and special engineering skyrocket costs and wipe out all savings, sorry to say. My commercial work is in schools in other countries. Search our Natural Building Blog for what we’re doing in Nepal. Millions of do it yourselfers want to build their own homes, but the codes are making this increasingly difficult. Try reading the code book at a library. You’ll probably last one minute. This is no accident. They only want to deal with building professionals. It’s all about money, money, money. Common sense question probably, but, I am digging the gravel foundation trench for the hexagonal building. Question is, when I’m measuring the lengths of the walls, all sides are the same length right? Say 20 ft front, 20 ft angle, angle, back, angle, angle.. How much of a slant do I go from the front wall? How do I know how wide? Does that make any sense ? This is called building layout. You need to understand all the angles and lengths, and stake out the entire project with wooden stakes first before digging. You can find the angles by searching any search engine: hexagon angles. Thank you. Thank you for doing what you do. I really like this plan! I think instead of the domes I would like the parapets, so it looks more like a castle. Any thoughts? How do Get these plans and what do they entail.. Are they full ma with electrical ? How do I get the blueprints for this earthbag lodge with domes? You can find this plan for sale at http://dreamgreenhomes.com/plans/lodgedome.htm These are very basic generic plans that do not have electrical or plumbing details.